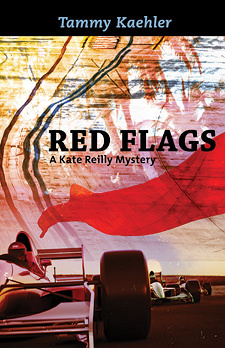 When Kate Reilly arrives in Long Beach, California, a week ahead of the Grand Prix, she's immediately plunged into a new social scene—as well as a murder investigation. Her cousin Billy is found dead, with Kate's card in his pocket. The cops want to know why, and sponsors and race organizers—anxious to keep racing's image clean—want Kate to investigate. Doubting she can solve another murder, especially that of a relative she despised, Kate reluctantly agrees. At the same time, coaching a gorgeous and talented actress for a celebrity race brings Kate into the orbit of Hollywood's hottest bachelor. And then a local FBI agent takes notice of more than her driving and sleuthing skills. She goes from Sony Studios to Venice Beach and from Rodeo Drive to the Hollywood Hills, attending parties, power-shopping, and dodging unwelcome paparazzi. Kate's ballooning media exposure generates national commentary, testing her composure and forcing her to get ahead of the stories—whether critical or flattering. Kate's professional dreams are also coming true. The upcoming Grand Prix is her first race with a new sponsor that's also funding an IndyCar test drive and a ride in next year's Indy 500—along with future possibilities in NASCAR. The downside? New sponsor Frame Savings is owned by her family, and its management, outside of her long-estranged father, is unfriendly to her...even rivalrous. Kate must stay on her toes as the Long Beach race weekend begins. She's negotiating the next steps in her career, driving two racecars and coaching a third, discovering more about the disreputable members of her father's family than she wanted to know, and juggling questions and suspects. On track, red flags fly to warn her of danger. Off track, Kate struggles to interpret warning signs and stay out of a killer's grasp. "Such a pacy, twisty cocktail of celebrity culture, family dysfunction and full-on glamour would be delicious anywhere, but the top-notch race-world setting makes RED FLAGS irresistible. Like Kate's Corvette, we're in good hands." "This award-winning series offers an authentic racing experience—vetted by Pippa Mann, Oliver Gavin, and others—with murderous twists. Perfect for significant others who can't understand why you love racing." "a good read that will show you the workings behind one of America's favorite sports."